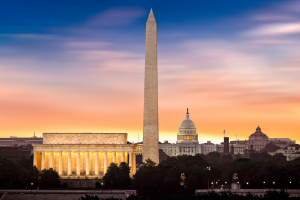 On behalf of the host chapters, George Washington University and University of Connecticut, we invite you to attend the 2019 Beta Alpha Psi Atlantic Coast Regional Meeting being held in Washington, DC on March 15-16, 2019! This year’s event and theme, "Inspiring Future Leaders to Leave a Legacy of Excellence," is designed to provide you with opportunities for leadership development, while building professional and social relationships with other chapters, professional partners and the Beta Alpha Psi Organization. We hope to see you there! For chapters who wish to present in Chapter Operations: Chapter Operations Abstract Form. The due date is Friday, March 1, 2019. Cancellation policy: Cancellations made prior to Friday, March 1, 2019, will be refunded. Cancellations received after this date and no-shows will not be refunded. If you encounter an emergency, please contact the conference planner at beth.fulk@aicpa-cima.com and the request will be forwarded to the Executive Director for refund approval. *To receive the group rate, please indicate that you are part of the 2019 Beta Alpha Psi Atlantic Coast Regional Conference. Attendees receive a 50% discount on self-parking (currently $34.00). The Metro yellow line will take you from Crystal City (a 10-minute walk from the hotel) to Gallery Place, which is where the Capital One Arena is located. Gallery Place is the fifth stop from Crystal City and takes approximately 15 minutes and cost $2.55 each way. To use the Metro, riders must purchase a metro card for $10 which include $8 in fares (i.e., the card cost $2). The cards can be purchased at the station.